The boutique hotel on Isabela Island was ranked #15 of all small hotels in Ecuador, and achieved #22 in service for all hotels in Ecuador. 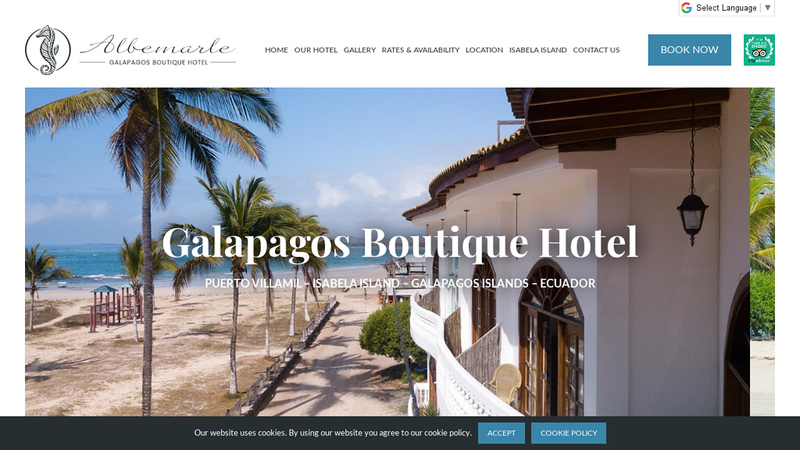 (TRAVPR.COM) ECUADOR - February 1st, 2019 - Already known as one of the top hotels in the Galapagos Islands, Hotel Albemarle added two more feathers in their cap at the recent TripAdvisor 2019 Travelers’ Choice Awards. In a country as diverse as Ecuador, it was an honor to receive an award for being among the Top 25 Small Hotels in Ecuador for the second consecutive year. With a beachfront location perfectly positioned on the most romantic of island in the Galapagos, Hotel Albemarle ranked #15 in Ecuador and was the only hotel on Isabela Island to make the prestigious listing. With very attentive owners and staff, who are on hand to ensure an exemplary guest experience, recent renovations and room upgrades have helped to elevate Hotel Albemarle into a leading service hotel as well, ranking #22 among all hotels in Ecuador. No other hotels in the Galapagos Islands made this list. As the only Galapagos Hotel recognized for both service and overall quality in the 2019 TripAdvisor Travelers’ Choice Awards, Hotel Albemarle sends out a huge thank you to all past guests who have stayed at the hotel and left reviews for future travelers. Want to experience the best hospitality in the Galapagos Islands? Rates start at $165US/night and can be reserved online at www.hotelalbemarle.com, or email Hotel Albemarle at info@hotelalbemarle.com with any booking requests. Operated by Galakiwi, a leading Galapagos tour company, Hotel Albemarle is a small, boutique hotel with a picturesque waterfront location on Isabela Island. Offering a selection of ocean view and pool side rooms, complimentary breakfast, hotel wi-fi, and day tour booking assistance, Hotel Albemarle is the ideal choice for a family or romantic getaway in the Galapagos.